The thing about the TV series "Star Trek" -- the original series, mind you, the one the Trekkies and Trekkers call "TOS" -- was its dramatic architecture. Never mind all that "'Wagon Train' to the stars" foofraw: "Star Trek" was more in the dramatic mold of military memes like "12 O'Clock High," "Command Decision" and "The Caine Mutiny." "Star Trek: The Key Collection"
And why not? Creator Gene Roddenberry, like half of Hollywood in the 1960s, was a World War II vet who was still absorbing the bruising psychological trauma of combat and the horrific responsibilities of command. Watch any action show of the period, and the heroes are always having second thoughts. 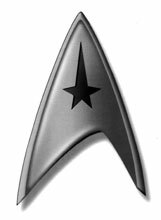 And so "Star Trek," born out of an inner need for order in a harsh universe, but one based on intellectual principles rather than religious, was built around the notion of command and the psychological stress it places on an individual -- as well as the individual's place within a team structure. The crew of the Starship Enterprise was a team, not co-workers, and its primary mission was peacekeeping and exploration. Showing the flag of what it means to be human. It was a starry-eyed view of an idealized military, and ask any of the thousands -- maybe millions -- of soldiers and sailors who enlisted in the last 40 years if "Star Trek" influenced their decision. No matter what wildness happened in the TOS episode, what it was ABOUT stayed the same: the responsibility of command. The structure had as its focus the Captain, who is advised about events continually by his Science Officer (the rational realist) and the Ship's Doctor (the dreamy humanist). These supporting characters verbalized the mental and ethical tug of war within the captain's psyche. And then "Star Trek" went off the air, and everyone assumed it was dead. But in the early '70s, thanks to an explosion of privately owned TV stations that needed afternoon filler, it began to reappear in reruns, and the "Star Trek" phenomenon began to evolve. 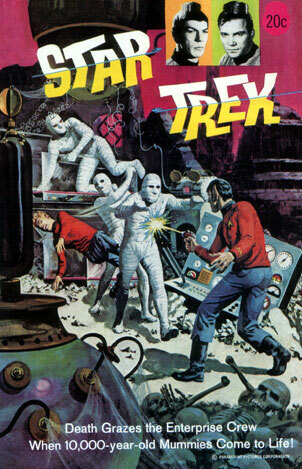 AT THIS time, Gold Key, one of the lesser players in the comics industry, began a brisk run of "Star Trek" comic books. They're not well known, and vanished after 61 issues, but they were solidly composed, modest vignettes that helped explore and expand the "Trek" universe. They bring good prices in the Overstreet comic book price guides, mostly due to Trekker insatiability rather than any amazing art or astounding storytelling. Thanks to Checker Book Publishing's apparently relentless efforts to mine our cartoon past, the Gold Key "Star Treks" are back in print, in collected books, and they're handsomely mounted on glossy paper. The references that exist today for "Trek" fans simply didn't exist in the early '70s, and there are detail differences that took a while to iron out. Dr. McCoy, for example, lasted several issues as a tall, blond young guy before the Giolitti studio was finally provided publicity photos of actor DeForest Kelley. And the comic book never did manage to get the details and colors of the uniforms right. All of this is lovingly reproduced in the Checker reprints, which are apparently high-quality scans of printed pages rather than of original artwork, as the color blocks have fat dots that are sometimes, amusingly, out of register. It's all rather sketchy, like a watercolor study rather than a completed image. The stories hold up well, though, and are solid jaunts into Trekworld. Many of the writers are uncredited, unfortunately, which is also in keeping with Gold Key's nonexistent boosterism of the period. "Star Trek" fans should gobble these up, and others will be entertained as well.